Three Girls: Papa's on the floor! We went to Kingsport a few weekends ago. 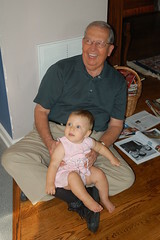 We all decided that there were few people who could get Papa Earl onto the floor - apparently Anne Marie is one of them. She showed Papa Earl her walking and magazine distribution skills.